Habermas argues that Western societies have succeeded to some extent in stabilizing the economic fluctuations associated with capitalism, but this has created a new range of crisis tendencies which are expressed in other spheres. States intervene in economic life and attempt to regulate markets, but they find themselves confronted by increasing and often conflicting demands. As individuals become increasingly disillusioned, the state is faced with the possibility of a mass withdrawal of loyalty or support - a 'legitimation crisis'. 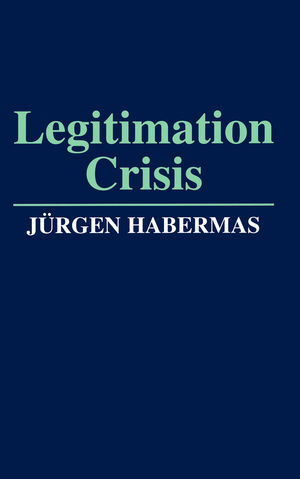 Widely recognized as a classic of contemporary social and political analysis, Legitimation Crisis sheds light on a range of issues which are central to current debates, from the decline of class conflict and the disillusionment with established political institutions to the crisis of the welfare state. It remains essential reading for students of sociology, politics and the social sciences generally. Jürgen Habermas is a German philosopher and sociologist in the tradition of critical theory and pragmatism. He is perhaps best known for his theories on communicative rationality and the public sphere. In 2014, Prospect readers chose Habermas as one of their favourites among the "world's leading thinkers". Part I: A Social - Scientific Concept of Crisis:. 1. System and Life = World. 2. Some Constituents of Social Systems. 3. Illustration of Social Principles of Organization. 4. System Crisis Elucidated Through the Example of the. Part II: Crisis Tendencies in Advanced Capitalism:. 1. A Descriptive Model of Advanced Capitalism. 2. Problems Resulting from Advanced - Capitalist Growth. 3. A Classification of Possible Crisis Tendencies. 4. Theorems of Economic Crisis. 5. Theorems of Rationality Crisis. 6. Theorems of Legitimation Crisis. 7. Theorems of Motivation Crisis. Part III: On the Logic of Legitimation Problems:. 1. Max Weber's Concept of Legitimation. 2. The Relation of Practical Questions to Truth. 3. The Model of the Suppression of Generalizable Interests. 4. The End of the Individual?.